As its name suggests, Pucks Glen is a magical place to visit, and we hope whilst staying in Pucks Glen Lodges will have an equally charming stay. Pucks Glen Lodges are a popular with holiday visitors taking short breaks and retreats from the city and are suitable for families and couples inspired by the beautiful Argyllshire countryside. Many regard Cowal as off-the-beaten-track, so it is not as busy as some Scottish destinations, but there is plenty of things to see and do which entice visitors to return again and again. A clear sky at night is a wonder to behold. At dusk observe the wild Red Deer herd chancing the open for the lush green grass, spot the Red Squirrel which is common in these parts. If you are lucky you might glimpse an Otter on the river or lochside, even the Pine Marten is occasionally seen. For those looking for action and adventure, Paint balling, Quadbiking, Cycling and Swimming are all available in the vicinity. And there is fine dining to be experienced in Dunoon and on Loch Fyne, as well as many country inns offering country fare. 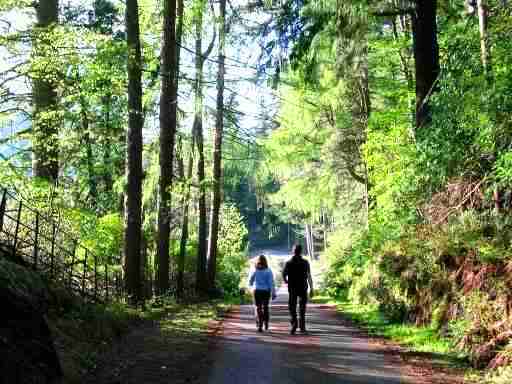 What better place to stay than Pucks Glen Lodges, holiday cottages near Dunoon, for a highly enjoyable and memorable break away. You can book online today. Listed above are many of the wonderful things there are to see and do in the area near and within easy driving distance from Pucks Glen Lodges. There really is so much to do if, that is, you even want to leave the comfort of your cabin. You will resolve to return. Tourist information is provided in your lodge, and our local representative (owners) can be available at the drop of a hat if you need any advice.